Effective supply chain strategies are essential to the performance of most businesses. Surprisingly, many businesses, even at the top end of town, have supply chain strategies that are misaligned to the business goals or have strategies that are poorly articulated and communicated within the business. This just drives poor business performance. This article will take a pragmatic approach and provide insights for developing a supply chain strategy that not only meets the needs of your business, but also drives real service and bottom line improvement. Firstly, we need to appreciate that the supply chain strategy forms only one part of the overall business strategy and takes its place along side other strategies such as; marketing, new product development, human resources, information technology and finance. 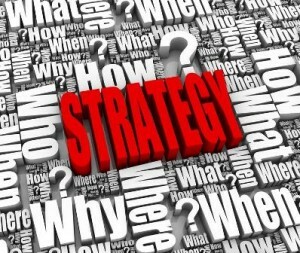 However, these strategies must all link directly to and support the overall business strategy. Appreciate that businesses all have different strategies and this drives the need for different supply chain strategies. By looking at examples of retailers, the picture starts to build. Some retailers might be targeting basic needs, whereas others might target high fashion and self-expression. Companies such as Zara and H&M need supply chains that are effective for very short life cycle products. Whereas solutions focused retailers such as Home Depot or Bunnings must focus on high availability and good range management. Mass retailers such as Tesco or Wal-Mart meanwhile need efficient low cost supply chains to compete in the market place. A business’s target market and customer value proposition are clear drivers of the supply chain strategy. Looking away from retail, businesses such as Orica Mining Services, who supply bulk explosives to the mining industry, also offer services that could include providing drilling crews, survey crews and shot firing teams. Companies like Orica provide these products and services in some of the most remote parts of Australia. This indeed needs a very different supply chain strategy to maintain appropriate levels of service, whilst controlling costs. Whilst in most businesses an appropriate balance of cost and service is the goal, in some the supply chain cost takes a clear second place to maintaining continuity of service. Clear examples of this service supremacy abound in the Healthcare sector such as the Red Cross Blood service. Here, the cost of providing a life saving blood product to remote hospitals and surgeries is almost immaterial. Saving lives and maintaining critical supplies is the primary objective. Whereas a business selling a packet of men’s socks for $8.99, must have a supply chain that is very low cost to achieve any measure of profit. In any supply chain, there are a multitude of key functions and processes on which to concentrate. The danger to avoid is being too blinkered and losing sight of the big picture. In most businesses for example, COGS (Cost of Goods Sold) is by far the largest cost within the supply chain. So buying well stands out at a clear priority. Whilst at the customer end of the supply chain, the focus must be around service and product availability. Good supply chain management does not focus solely on IT systems, warehouse productivity or outsourcing options. Good supply chain management focuses on the results delivered at the customer end; good operational management takes care of the details. The strategic focus of any supply chain emerges from the overall business objectives with a focus on the ‘end game’. The ends, rather than the means to the ends. The end game will vary from business to business and can be thought of in terms of the strategic imperatives for the supply chain. Once these strategic imperatives are identified and affirmed at the most senior levels of the business, developing an appropriate supply chain strategy becomes far easier. These strategic imperatives will vary by industry and business and be guided by the business objectives, but some examples are offered here to illustrate the concept. A Healthcare Business: (1)Service assurance (2)Best compliance (3)Best range. A Building Products Business: (1)Delivery where you want it; (2)all your products in one place, (3)price will never be an issue. A Mass Retailer: (1)Always in stock, (2)Lowest prices, (3)Quality products. These strategic imperatives must be developed by the business and embraced throughout the business, so that it becomes almost a jingle or mantra within the business. Good examples are Woolworths with “the fresh food people” and Bunnings with “lowest prices are just the beginning”. These are far more than mere advertising jingles; they drive the whole focus of the business and the supply chain in an agreed direction. Good supply chain management requires knowledge of the key trade offs within the business and informed decision-making. With the supply chain strategic imperatives nailed down, many often silo focused decisions can be avoided, as everyone has a clear focus on the end game. Some businesses still fall into the trap of making strategic and tactical decisions based on a one-size fits all approach to the supply chain. It is important to understand the need for flexibility and adaptability within any supply chain, but this is forgotten all too often. Evidence still abounds of standard service policies for all customers, and standard sourcing and channels to market approaches. Value stream thinking can be useful here to illustrate the need for flexibility and adaptability. Taking a grocery retailer as an example, there are products within the range that have very different demand characteristics and management needs. These are often split into continuity products, non-continuity products and seasonal products. Continuity products have steady predictable demand year round and are pulled through the supply chain by customer demand. Non-continuity products meanwhile might require greater life cycle management (such as in fashion), and may typically be managed with an initial push allocation, followed by pull replenishment based on sales. Finally, the seasonal products require more focus in terms of seasonal and critical path planning to ensure availability in season and minimal waste or mark down at season end. Thinking of the product range in terms of these value streams, starts to provide the realisation that supply chains need a range of tactical and operational ‘means’ to achieve the business ‘ends’. Any supply chain strategy needs this pragmatic approach to the lower levels of detail and an acceptance that plans may and will change over time as the business changes. One of the main reasons for supply chain strategies failing to deliver the expected results will be inadequate ‘buy in’ at the most senior levels of the business. The importance of this cannot be over stressed. Where supply chain strategies are developed in isolation, by the supply chain team alone, they invariably fail. This will often be due to a lack of focus on the big picture, which the senior executive team can bring to the process. The buy in stage of strategy development should focus not only on ensuring the business objectives are clearly supported, but must also articulate the business benefits to the senior executive team in language that is meaningful to them. If particular elements of the strategy do not deliver improved margins, reduced costs, improved service or other end game objectives, they need to be seriously questioned. The very successful process used by Logistics Bureau for example, includes one on one discussions with the CEO and all the major department heads and a series of short workshops designed to tease out the supply chain strategic imperatives based on the business’s needs. Communication and buy-in are also of course important at the lower levels of the organisation as well as externally with customers and suppliers. There can be a tendency for those at the operational level of businesses to measure ‘stuff’ that is of little real management value. Certainly, the Key Performance Indicator (KPI) needs of managers across the business will vary and must aid improved operational management, but at the top levels of the KPI ‘tree’, KPIs link directly to the strategic imperatives. For example if one of the strategic imperatives is ‘Always in Stock’, the top level KPIs need to focus on this. Appropriate KPIs might include; store on shelf availability; distribution centre availability; supplier in full on time (SIFOT) performance and delivery in full on time (DIFOT) performance to stores or customers. Below these top level KPIs, the next layer provides visibility of the causes of performance failure. As with the strategic imperatives, the KPI focus will and should vary dependant on the industry and specific business focus. Not understanding the customer’s needs. Failure to gain senior executive buy in. Failure to gain employee commitment. To appreciate how appropriate supply chain strategies drive business performance, case study examples are always interesting. A very brief look at Walmart, Nokia, and H&M will help illustrate this. Walmart. (Change management approach) In 1995 Walmart bought Woolco in Canada. The purchase included all the stores but not the distribution centres. A new distribution centre network was required to be up and running within three months and this was made possible by forming a joint venture with UK based 3PL, Tibbett and Britten. This rapid and significant change was possible not only by the very strong Walmart culture, systems and processes being overlaid on Woolco, but also by the approach to change management. This approach included a buddy system whereby Walmart key executives spent months with Woolco counterparts and were given substantial training at residential courses. The Walmart culture was embraced and adapted for the Canadian market and ensured that the highly compressed project timelines were met and that Walmart Canada went on to not only a very successful launch, but also significant growth in the years to come. Nokia India(flexibility and innovation). Nokia has an innovative supply chain approach to support the business in India. India has a very high mobile phone usage, due to having some of the cheapest tariffs in the world. Whilst teledensity in the cities is 30-35%, it drops to 2-3% in the country. This was Nokia’s target market. Nokia makes hand sets specifically designed for the Indian market with low functionality cheaper handsets for the rural areas. Given the opportunity in the rural markets and the fact that in India mobile phones are sold through over 100,000 retail outlets a specific supply chain strategy was required. This includes ‘marketing vans’ supporting sales in the rural areas and a partnership with HCL as distribution partner, who already had a well established network. H&M. (responsiveness). H&M is the world’s third largest retailer with 1,600 stores in 33 countries. The focus is fashion at reasonable prices. H&M have 20 production offices in Asia and Europe and have about 80 suppliers. The Stockholm head office designs all the garments, which are made in Asia and Europe. Shorter lead-time products are made in Europe. Store replenishment is a very high focus with new products being ranged on a day-to-day basis. The H&M approach is almost to panic the customer into buying what they see, as it may not be ranged the next time they come to the store! Whilst we can learn a lot from these world-class businesses, we should not overlay their supply chain strategies in a boilerplate fashion on our own businesses. Valuable lessons are there, but every business’s supply chain strategy should be tailored to the needs of that business alone. In the Australian market specifically, we must ensure that we take adequate account of much lower sales densities that in Europe or the USA and often much longer supply lead times just as two simple examples. P.S. If you would like help developing a supply chain strategy, jump over to this page supply chain strategy consultants. Need assistance in reports on the supply chain strategy being developed by any beverage manufacturer. Would love to share, but those are client confidential. Sorry.